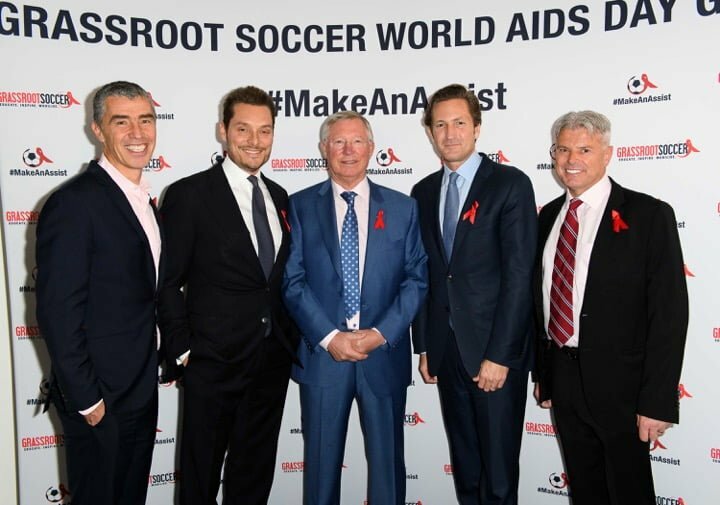 LONDON, ENGLAND — On Friday 1st December, to mark this year’s World AIDS Day, celebrities, footballers, and leaders in business and media came together to support a fundraising gala evening for Grassroot Soccer at 8 Northumberland, in London’s West End. 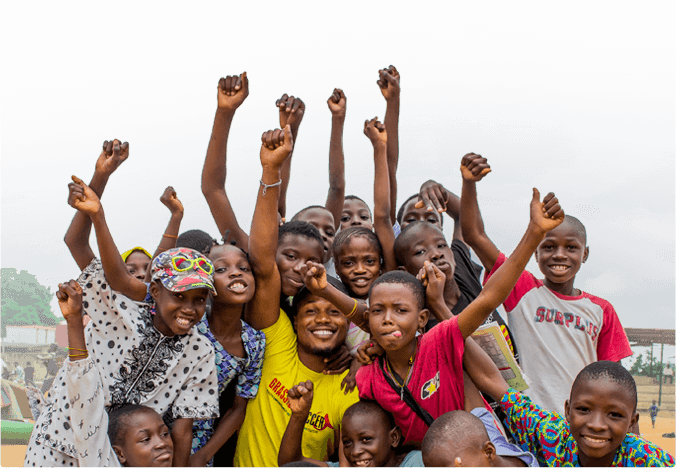 Grassroot Soccer uses soccer as a platform to educate over 2 million young people in 50 countries around the world about health issues, including the dangers and preventative measures of one of the greatest health challenges in Africa: AIDS. More than 300 guests attended and the World AIDS Day Gala raised £600,000, which will make a significant impact in the lives of thousands of youth. 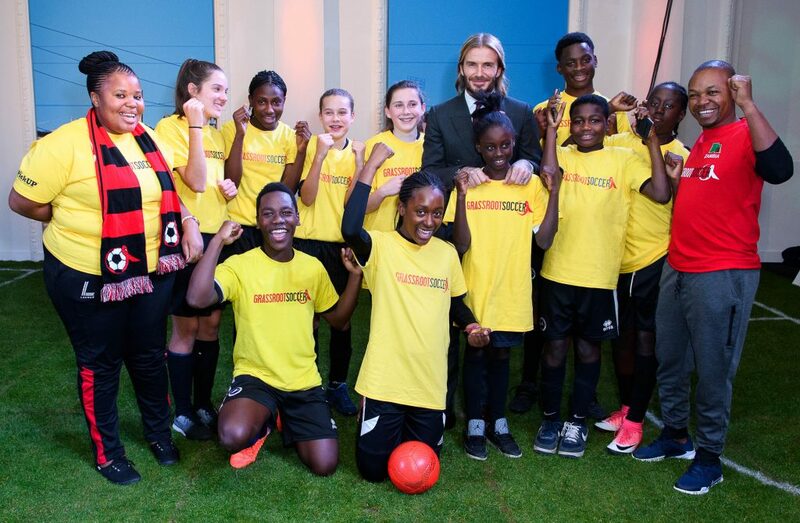 David Beckham, OBE with Grassroot Soccer program staff Busi Mafatlae (far left) and David Kapata (far right), along with local London youth during a Grassroot Soccer activity demonstration. Other notable guests included comedian Jack Whitehall, singer songwriter Ronan Keating along with his wife, fashion designer and producer-director Storm Keating, singer-songwriter Anastacia, legendary football manager Sir Alex Ferguson, CBE, TV presenter Davina McCall, model and TV presenter Lilly Becker, and Strictly Come Dancing star Pasha Kovalev. They were joined by many footballers, including United States international and Women’s World Cup winners Christen Press, who is an ambassador for the organisation, former United States international, Women’s World Cup winner and current Arsenal player Heather O’Reilly, United States International and Women’s World Cup winner Tobin Heath, and former pro footballers Phil Neville and Quinton Fortune. 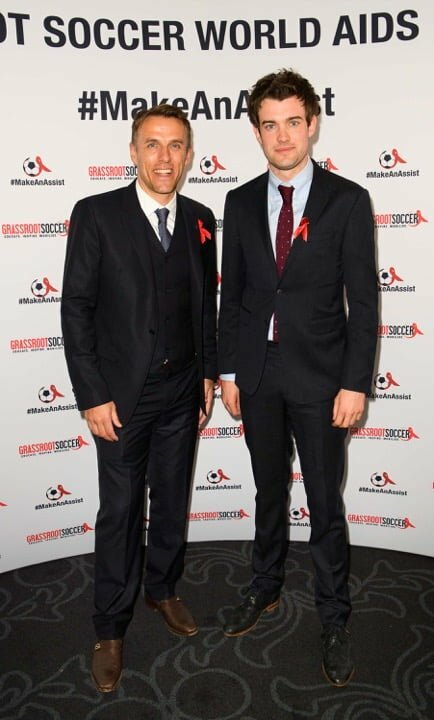 Former Manchester United player Phil Neville (left) and comedian Jack Whitehall (right). A soccer pitch transformed the venue and provided guests the opportunity to observe and participate in demonstrations of Grassroot Soccer’s vital programme it uses in Africa to educate and inspire young people to save lives and give them hope for the future. The demonstrations were led by coaches from Zambia and South Africa. Guests were also treated to a performance by London’s internationally renowned Capital Children’s Choir and Duduesta, the UK’s leading professional African marimba band. The evening was sponsored by Belvedere Vodka, Kiehl’s, Atelier Cologne, and Tesla. There was fierce bidding in the auction. Among the hottest prizes of the night were a Getty Images Premier League experience offering the opportunity to be a professional match photographer for a day, and an exclusive painting by renowned artist Nicola Green, featuring an image of David Beckham striking a football and signed by the subject himself. Grassroot Soccer has provided health education, access to testing, and support for treatment to over 150,000 young people in the past year, with programmes in countries with the highest levels of HIV in the world, including its flagship projects in South Africa, Zambia, and Zimbabwe, plus other nations with a high HIV rate such as Nigeria, Malawi, and many more.